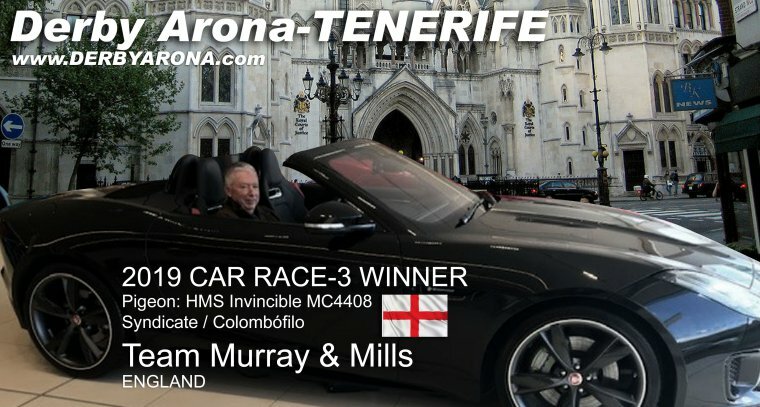 Home › News & Articles › News › Syndicate Team Murray & Mills (UK) 1st semifinal car race-3 winners at Derby Arona Tenerife 2019! An approx. 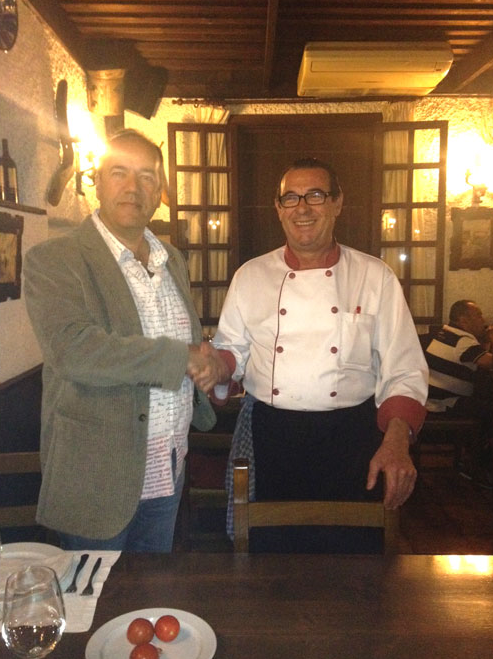 distance of 230 km of open waters between the liberation site and the lofts in south Tenerife. Taking top honours with 1stuk& Ireland 1st international and car race 3 winner was the previous gran canaria additional training race winning pigeon named hms invincible for the syndicate of Murray and mills representing England with a winning time of 12.00.07.80 collecting for its efforts the 8,000 euro prize fund and winners trophy ,just one second ahead of the 2nd prize winners from Slovakia team sadlak, vendelin & Andrej with pigeon super 07 on 12.00.08.55,also picking up a worthy 2,000 euro prize and runner up trophy ,the 3rd international position goes to the 2014 Derby ARONA final race winners from the neighbouring island of gran canariayahve,oliviero,fredy,Miguel,as pigeon gerd timed in on 12.00.08.56 collecting the 1,000 euro prize along the way ,for positions 4th to tenth each of the returning pigeons in such positions also claim a cash sum of 220euro wit the first of which in 4th place going the oener brothers syn from the Netherlands with pigeon veni on 12.00.20.10, with team Germany and rolfbergers entry flendermaus taking 5th on 12.00.31.20, a second arrival for te Netherlands sees b goedee with pigeon gitano taking 6th on 12.00.33.15, team usa come in for 7th as team blessing family lofts syndicate and pigeon barbaro comes onto the clock on 12.00.33.20, resulting in team sweden settling for 8th place as pigeon bolja for team top 5 on 12.00.34.35,the usa take another top ten position in the race in 9th as pigeon lin-1121 for team lin family lofts timed in at 12.00.35.00 as team hungary claim the final top positon in 10th with pigeon rebi for team horvarth and varga 12.00.35.20. 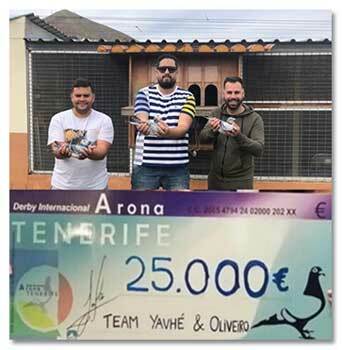 Team Yahve, Oliviero, Fredy, Miguel, as pigeon gerd (Gran Canaria) 3rd international semi final race. As we prepare for the final race at the end of the month with no additional training currently scheduled we must embrace the stamina and courage and bravery of the pigeons that remain within the race which will take on a return visit to Fuerteventura on march 29thfor their final assault and the prospects of claiming Europe’s biggest prize of 120,000 euro, during such time the team are continuing to condition and maintain a high level of fitness of these worthy athletes with daily loft exercise between the semi-final and final race. 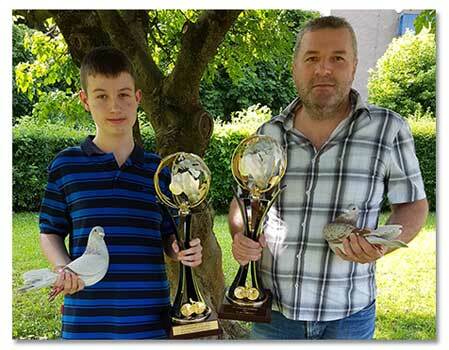 Team Pouw & Willems with their entry Bolero, leaders in the “king of sprint averages”. In the king of the Atlantic challenge team gb are currently holding two prime positions as todays winning syn of Murray and mills with pigeon hms invincible are on top 43.520 pts, team Scotland take the 3rd for team William Donachie as pigeon it wasn’t me accumulates 42,730pts divided by pigeon vini holding another 2nd place standing for team oener butchers from the Netherlands on 42,745. 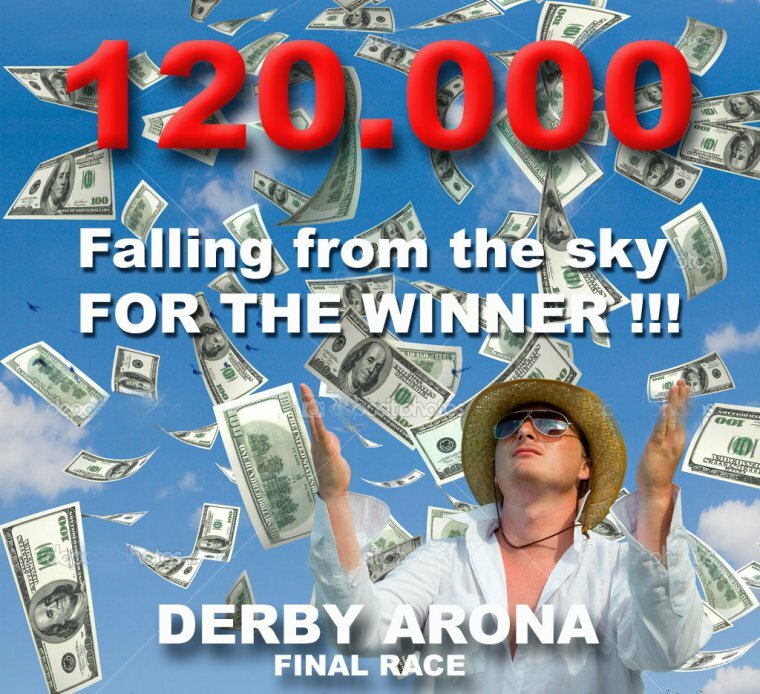 After four months of vigorous, challengingand on times rewarding, along with some disappointments we`re finally preparingto welcome fanciers from all corners of the world to the small island of Tenerife for the final hurdle the final of the Derby ARONA Tenerife one loft race 2019. Awards/Party Dinner at Mare Nostrum Hotel. 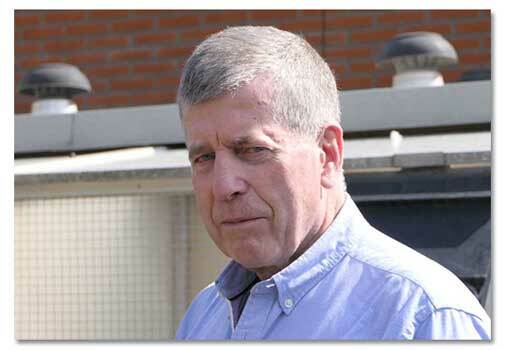 60-euro pp. Tickets can be reserved on basketing/final race day or via email to sslpm.oa mgaootlcdoay@d prior to arrival in Tenerife.